M-check – this teaches you how to assess your bike, looking for faults that have already occurred and learning best to prevent problems happening again. Puncture repair – Being able to confidently fix a puncture is a great skill to have. Even if this is something you are comfortable with, participants normally pick up a tip or two to make the job easier and cleaner! Brakes – here we learn how to maintain our brakes and go through how to replace cables and pads. On hydraulic system, we do not cover bleeding in this course, but do cover pad replacement and how to look after you rotors and set up the caliper. Gears – Gears are often somewhere people have real difficulties with. We will demystify the gears, teaching you how to get crisp shifting every time and how to replace a gear cable. Not suited to electronic shifting. Freetime – At the end of the course we leave a bit of time for anything extra not covered in the course, or for further practice on what we have covered to help what we have taught sink in properly. 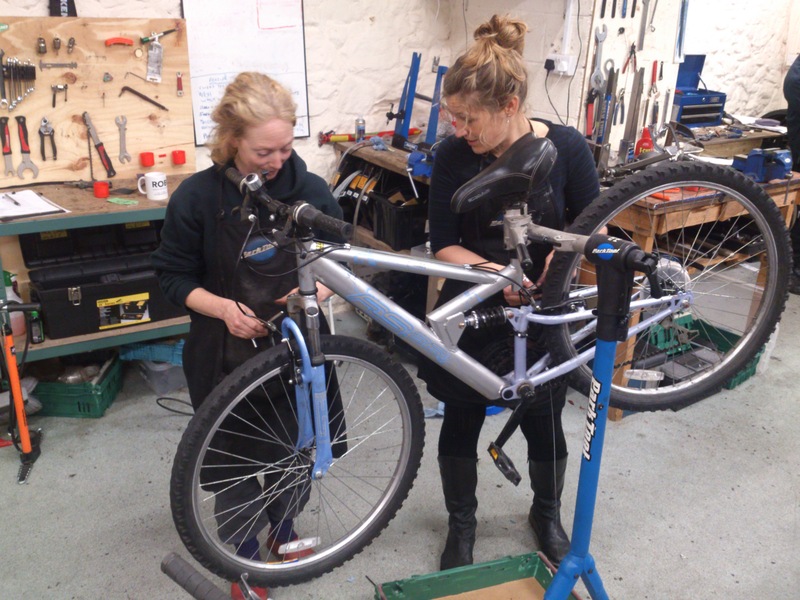 After the course, each participant is welcome to come to our weekly Bring Your Own Bike sessions – so you have a fully equipped workshop you can access giving you no excuse not to put your new skills to good use! Spaces are limited to four students in a relaxed and supportive environment. If needed, new cables, tubes and brake blocks are available in the workshop at RRP and you can access good quality secondhand parts if you need to. The day runs from 10-4. 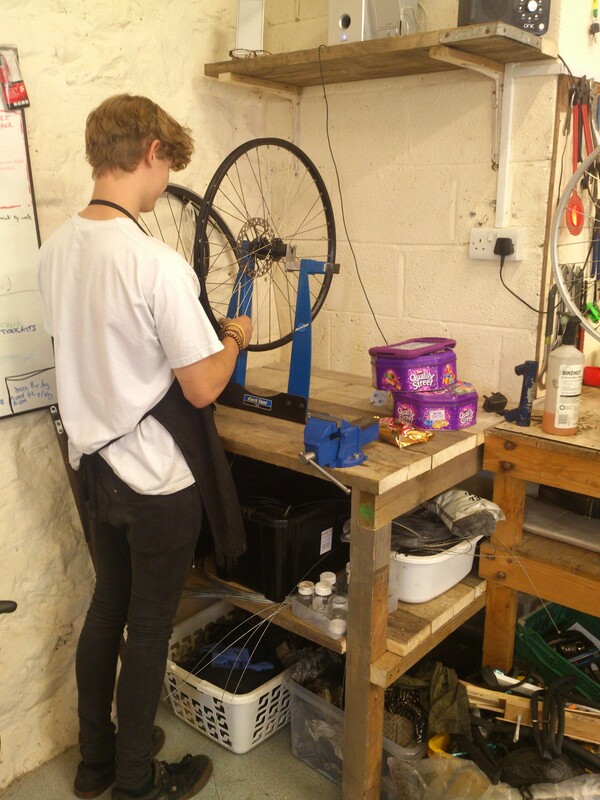 The cost for the course is £65 (or £71.50 with a gift aid donation) – Think of it as your first DIY bike service BUT with the hassle and uncertainty taken away – it comes with full support from one of our qualified mechanics. There is half hour break lunch so bring your packed lunch and enjoy the lovely view of Exeter Canal basin from the deckchairs in our yard. (Weather permitting!) or visit one of the many great independent cafes nearby. I’m a health aware acupuncturist who regularly extols the virtues of exercise. I know it helps various health problems from high blood pressure to arthritis; however, I loathe exercising for exercise sake! To motivate myself to go for a run or join a gym is almost impossible. I need to be sneaky with myself and do things that are fun or useful but also benefit my health. Cycling fits the bill perfectly and I have been nipping around town feeling very ‘green’ whilst also staying a bit fitter. I decided I wanted to know how to maintain my trusty ‘steed’ before heading further afield and was recommended a charity called Ride On. I enrolled on their bike maintenance course and pedalled down to the quay last Saturday and got stuck in. Adam, our qualified mechanic for the day, was a patient teacher and before long we had the back wheel off our bikes, whipping the tyres off to fix imaginary punctures. It was great to be working on my own bike with the support of an experienced mechanic by my side. The most basic of questions were answered without a snigger and by the end of the day I could adjust gears and brakes (amongst other things) and felt very confident with an oily rag.